We’ve put together a list of some frequently asked questions to help you. For more information please call, 573-486-2266 or email us. QUESTION: How can I have Hermann Wurst Haus bratwurst shipped to me? ANSWER: You can call us at 573-486-2266 during our regular hours or you can visit our Web store to place your order. To ensure that your order is received in good condition, we ship our perishable products to you frozen, in a cooler lined with Therma lining and ice packs. We ship via UPS and will ship UPS ground or 2nd day air so that the package will arrive at your desination within 2 days of shipping. QUESTION: Are all of your more than 40 flavors of bratwurst always available? ANSWER: Your order is important to us and we try our best to fill them exactly as ordered, however if we are unable to fulfill your order as specified, we reserve the right to substitute another item of equal or greater value. QUESTION: What happens if I receive my shipment and the package was damaged or the product was spoiled when I opened it? ANSWER: We encourage you to open and inspect your shipment as soon as it arrives. If you have any problems please call us as soon as possible at 573-486-2266 or contact us via email at info@hermannwursthaus.com. QUESTION: What type of binder do you use in your bratwurst? ANSWER: We use a natural C-Bind (carrot fiber binder) in our award-winning bratwurst . C-Bind is an alternative to soy protein and dry milk powder, C-Bind is a naturally occuring binder created from concentrated carrot fiber. It increases water retention and delivers a juicier bratwurst, even if the meat is heat treated to higher than average temperatures. It does not effect the final taste of the bratwurst and is not an allergan. QUESTION: What is the best way to cook your bratwurst? If your received fresh bratwurst the label will say to make sure you cook to a safe temperature of 165°F. You can do that by grilling, baking or boiling them in beer and onions. On the other hand if you have received any of the hickory smoked, fully cooked bratwurst those flavors just require reheating. The label will clearly state if it is a hickory-smoked product. To reheat they just need to be warmed and you can do that anyway you like, grilling, baking, boiling, etc… heck you can even microwave them. You will know when they are done by touch. If you feel them and they are warm, you can eat them. It really is that simple! You can also get creative with your bratwurst by slicing them up for a pizza topping, mix into your favorite quiche recipe or even add it to your soups, the possibilities are endless. QUESTION: Which of your bratwurst are gluten free? 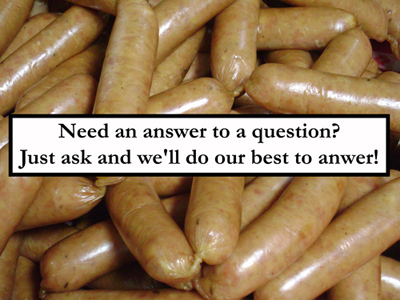 ANSWER: Our bratwurst flavors have no added gluten. There may, however, be gluten hidden in some added spices or added cheese. Our spice/cheese supplier may use gluten in some of their other products. The gluten would be at undetectable levels, less than 1 part per million. QUESTION: Are your Snack Sticks gluten free? Answer: Yes, all of our snack stick flavors are gluten free. QUESTION: Do you add nitrates to your products? Sodium nitrate is a naturally occurring substance in vegetables, water, soil and even air. It is also found in some salt in its natural state and has been used for thousands of years to cure meats. When nitrate is used to cure meats, it converts to nitrite and the nitrite then reacts with elements in the meat to preserve the meat. What do Nitrites do to meat? Nitrite gives cured meats its unique flavor and appearance and without it we could not have bacon, hot dogs, most sausages, hams and other meat products as we know them. The most important function of nitrite, in cured meat products, is that it preserves the meat by preventing the growth of certain bacteria. Are Nitrites safe to eat? According to the National Academy of Sciences, the American Cancer Society and the National Research Council, there's no proof of cancer risk from consuming sodium nitrite and therefore considered safe to eat. It may surprise you to learn that nitrites are produced in your own body in greater amounts than can be obtained from food and 70-90% of your exposure comes from your own saliva. When we talk about food, vegetables are the primary source of nitrites. Over 90% of the nitrite we get from food come from vegetables. One serving of arugula, 2 servings of butter lettuce and 4 servings of celery or beets all have more nitrite than 467 hot dogs. This is because USDA limits the amount of nitrite in hot dogs and bacon to 120 parts per million, and during the curing process the nitrite turns to nitric oxide and leaves only 10 parts per million in the finished product. *American Association of Meat Processors - The information contained here was gathered from multiple outside resources and has been compiled to provide factual science on the above topics for the consumer. The knowledge provided is a summary and does not contain all possible information about the subject. QUESTION: Are all your products made from locally raised beef, pork, chicken and turkey? ANSWER: The majority of our products are from locally raised beef, pork, chicken and turkey. This encompasses a 300 mile radius. Wurstmeister Mike has formed many friendships with local farmers during his 46 years of meat industry experience. QUESTION: Does your Wurst soda contain high fructose corn syrup? ANSWER: Our five flavors of caffeine free Wurst sodas contain no high fructose corn syrup. We use only the high octane stuff, real cane sugar, for a flavor like when you were a kid eating a frozen popsicle! QUESTION: Is your Blood Sausage cooked? ANSWER: Our Blood Sausage is fully cooked, ready to eat, just slice and eat cold, or we recommend reheating for breakfast. Just slice and warm it in a cast iron skillet with your eggs.